Preço: Download Gratuito O preço inclui os tributos aplicáveis. Vendido por: Amazon Serviços de Varejo do Brasil, Ltda. 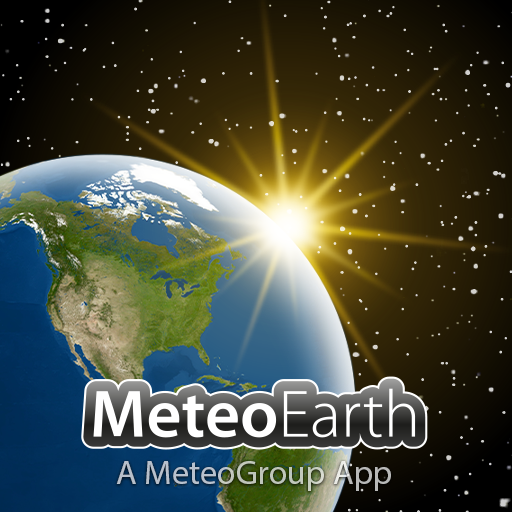 Thanks for downloading MeteoEarth! We are delighted to offer our users many of our Premium features for free, such as use of the storm tracker, multiple layer combination and more. To provide you with this additional data we've included ads which can easily be switched off, by all users who have already purchased MeteoEarth, accepting that the free premium features are disabled simultaneously. • Premium MeteoEarth users benefit from having an ad-free experience, viewing a forecast animation for 5 days ahead, and more. • Thanks to greater zoom, you can now view more live global webcams! Your opinion is valued, so if you like the app, then please take a moment to review it. Classificação: Livre Este aplicativo pode incluir conteúdo dinâmico. O que é isso? Choose and combine multiple weather layers to display cloud cover, precipitation, wind, pressure, etc. 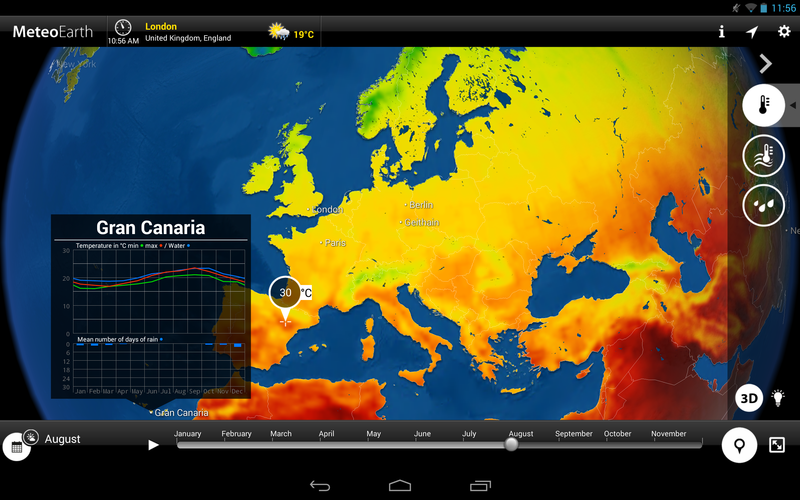 Connectivity to your FireTV - MeteoEarth and the big screen are made for each other! Adapted from a professional weather broadcast tool used by TV presenters around the world, and created by MeteoGroup, Europe’s leading private weather company; MeteoEarth truly brings the weather to life using high-end gaming technology and extraordinary graphics. 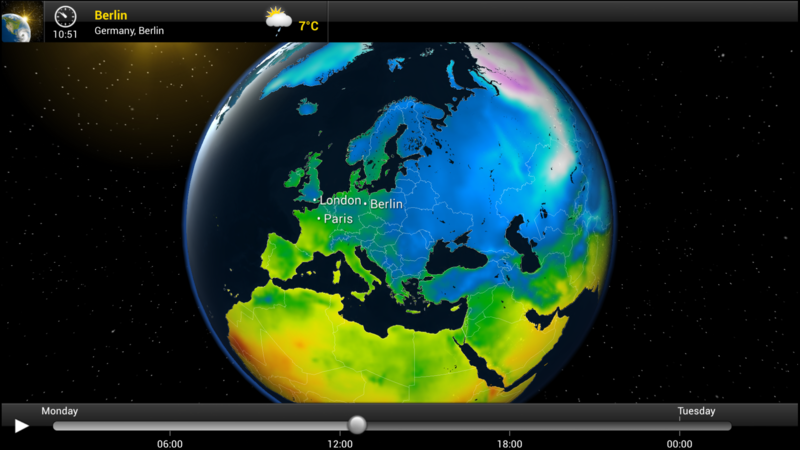 Discover our extraordinary planet’s weather today! • Choose and combine multiple weather layers to display cloud cover, precipitation, wind, pressure, etc. 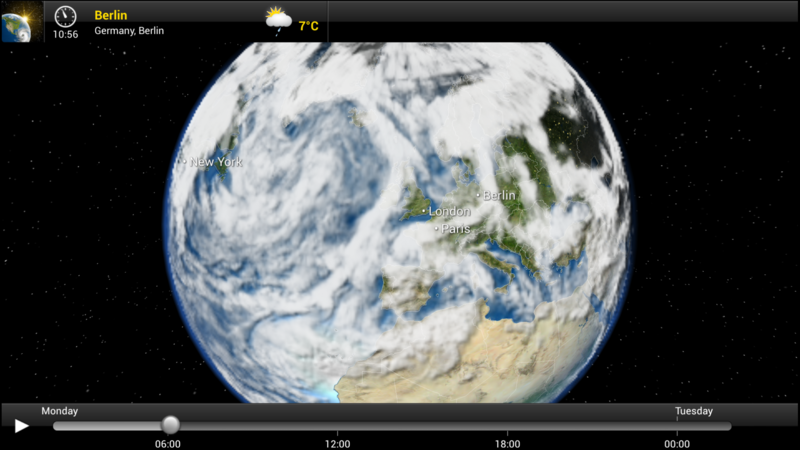 • Connectivity to your FireTV – MeteoEarth and the big screen are made for each other! We also offer a premium service! Choose the MeteoEarth Premium option for extended 5-day weather forecast and the option of checking wind conditions at any altitude right up to the Jetstream. ATTENTION: Please be aware that Premium subscriptions purchased with this app through the Amazon store are not transferable to other MeteoGroup apps and you cannot link this subscription to your MeteoGroup account. The premium subscription also gives users a better viewing experience by removing all ads. We included ads in the free version to offer our users many of our Premium features for free, such as use of the storm tracker, multiple layer combination and more. Additionally this helps us to ensure that our developers can keep updating and improving MeteoEarth, and that our support team (support@meteoearth.com) can continue to assist you with any issues. For more details please visit www.MeteoEarth.com, follow MeteoEarth at www.twitter.com/meteoearth or contact support@meteoearth.com. For a paid app, you would expect the full version, or at least in this case, the first year free. But no, you need a paid subscription to get even to see and use the full version. Highly deceptive. 67 pessoas acharam isso útil. 20 pessoas acharam isso útil. This app is normally priced at $4.99, which conveys the impression that it is packed with features. However, it appears to be mostly a shell from which to market purchase of the Premium upgrade. That upgrade would have been needed for most of the info that I need in a weather app. There are far better choices available. The app is also difficult to use: the buttons are tiny, and it is not obvious how to use them. I got this app as a FAOTD. As a weather geek I was really interested in this. I have to say the app appears very well designed with beautiful graphics and some cool functionality that I have not seen in other maps. 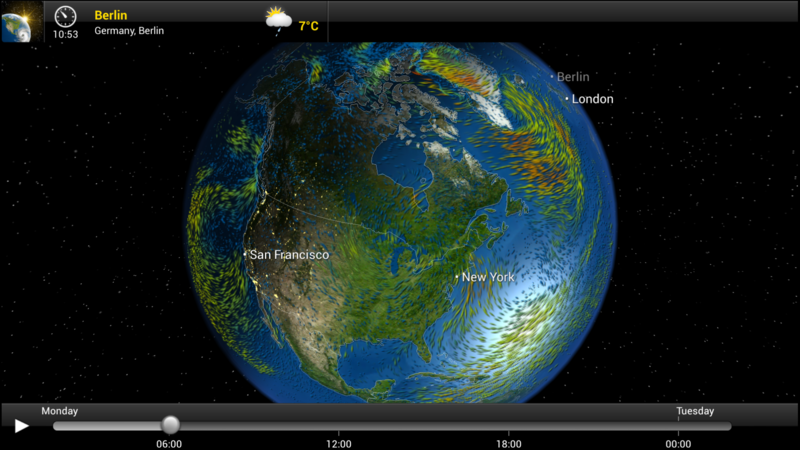 The ability to see model-based weather conditions throughout the globe is really cool. The zooming and rotating around the earth is smooth and allows you to see global conditions from any elevation. I don't have a huge problem with the fact you have to pay a yearly fee for the premium services. This is really a subscription fee for the data from Meteogroup which is necessary for the premium functionality. I went ahead and purchased a year of service through Amazon for $5.99. Here is my problem with this app. It would easily get 5 stars but for this major flaw which is related to Amazon not Meteogroup. The app clearly states when you purchase the yearly data subscription, you can use it for Meteogroup's other weather application WeatherPro. 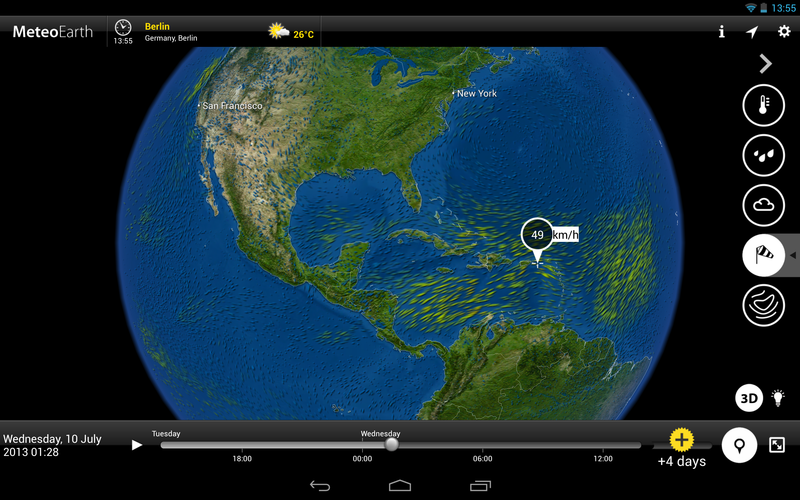 So I went ahead and purchased WeatherPro expecting that the $5.99 data subscription would work with it. Well, turns out you can only transfer the Meteogroup data subscription if you purchase the MeteoEarth and WeatherPro apps from Google Play. I feel this is false advertising since the app clearly stated the subscription would transfer to both. I emailed Meteogroup about this and they told me this was a limitation of the Amazon subscription service. 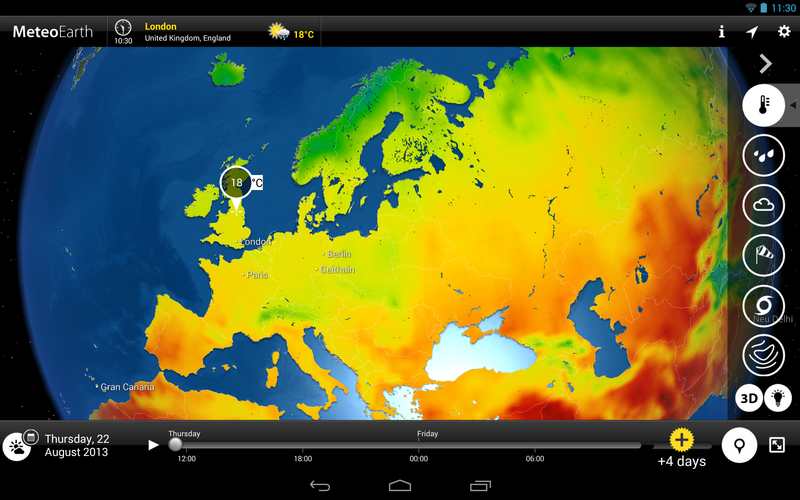 By the way, the WeatherPro App is pretty nice also. 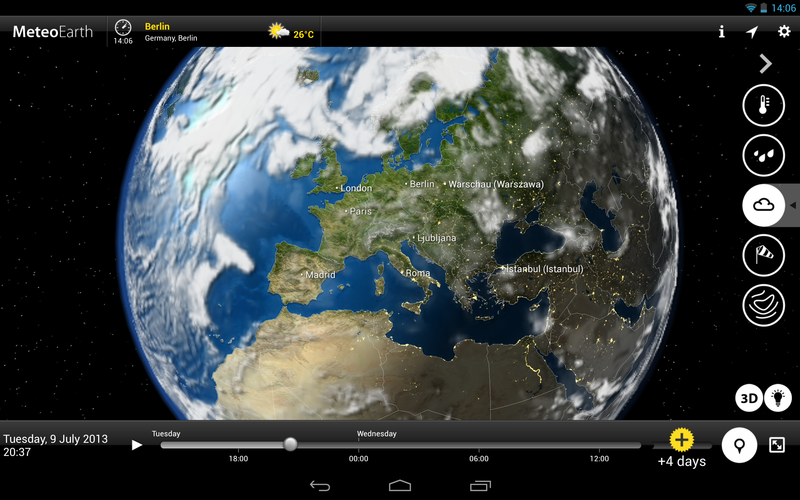 It will link to the MeteoEarth app for 3D views if you have both. 33 pessoas acharam isso útil. 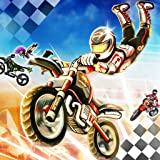 1,0 de 5 estrelasDON"T BUY THIS APP!!! I just paid $5 for this app, and then they ask me to upgrade to premium for another $2 to take full advantage of the apps features. You can do that with free apps, but not a $5 app! Such BS, I'm gonna delete the app, and hope no one else downloads this. 10 pessoas acharam isso útil.